Dark skies are a treasure, a part of our culture, a part of who we are as humans that we must preserve. Due to some enlightened and forward thinking in the late 1980s, the outdoor lighting code implemented in Flagstaff has thus far kept light pollution from completely overrunning our beautiful natural skies. From my back yard, 2.5 miles from the downtown commercial business center (click the thumbnail at right), I can see stars as faint as about magnitude 5.5 on a clear, Moonless night. In the video, North is towards the upper left corner. On the left side (NE), you can see that the sky background is noticeably brighter than toward the SW at right. 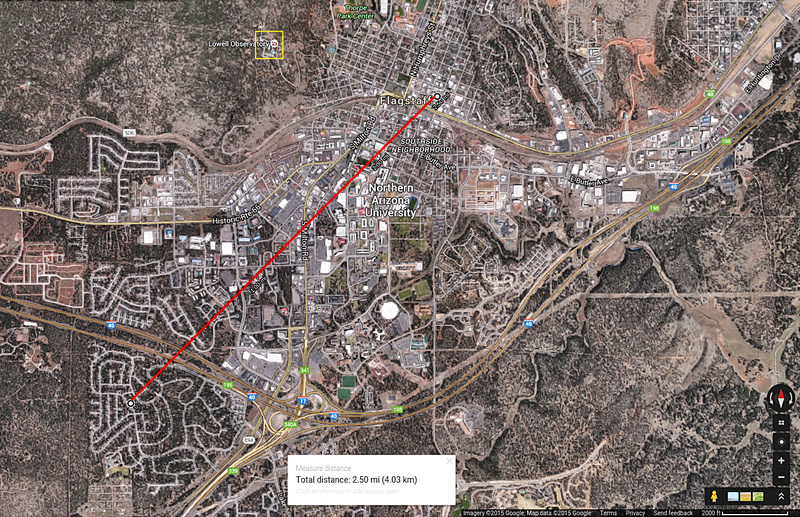 The center of downtown Flagstaff is toward the NE. This is 3.25 hours of the sky wheeling by in my Flagstaff back yard. Famous objects that appear: the Andromeda Galaxy (passes straight overhead), the Double Cluster in Perseus (left of Andromeda Galaxy), the Pleiades (towards the end, at the bottom), and Capella (towards the end, bright star at left). Camera: Canon G3 X, 30 seconds per “video” frame (15-second exposures).